Check out the new page. All In A Jar has a new page called Up Coming Classes 2017 . This is where you will find dates and descriptions of classes that will be held here at “The Farm” and All In A Jar will also be traveling to Alamo ” The Kitchen” for additional classes. So many new yummy recipes; barbecue sauce, compote, chutney, marmalade, relish, conserve, pickles, mustard, sweet sauce, pie filling and much more. Please check it out and share with family and friends. Save money, buy a series of three classes and get the four class free. Looking forward to having fun with you in class. Happy Canning . Please let me know if you would like to learn how to can something I don’t have on the list. I love coming up with new recipes. I have a few students letting me know they want to learn how to make mustard. I have a few mustard recipes I make but, I wanted to come up with something I had never made. So yesterday I played in the kitchen and came up with two new mustard recipes. My husband is favoring one over the other. Not that he didn’t like both. He just loved the one. He said we need some bratwurst sausages. The one he loves is Wasabi Mustard. It has a little kick to it. 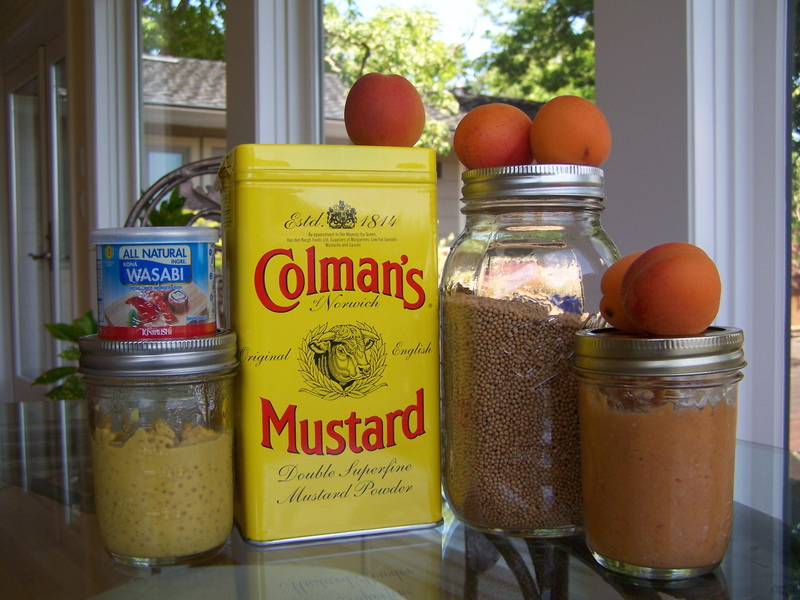 The other is Apricot Nectarine Mustard. When I was making the Apricot Mustard I was thinking about roasted pork, sweet apple sausage and making it into a glaze for grilled meats and vegetables. I was thinking of the wasabi mustard on sausages and fried fish sandwiches. Let me know what you are interested in learning next. Think of something and be creative! Check the class calendar; it goes to September 20th and I have a few mustard classes up and I will be adding the wasabi mustard in the fall. I need to find a spot to put the Apricot Nectarine Mustard before the apricot and nectarine go out of season. You can have a private class( a minimum of four students) to get the recipes you want, as long as the produce is in season. I always let my students know when friends and family know you know how to can, they start bring you food. One or twin a week I open the front door to find food. Love it. The best part of people giving you foods is that you can play and make new recipes. 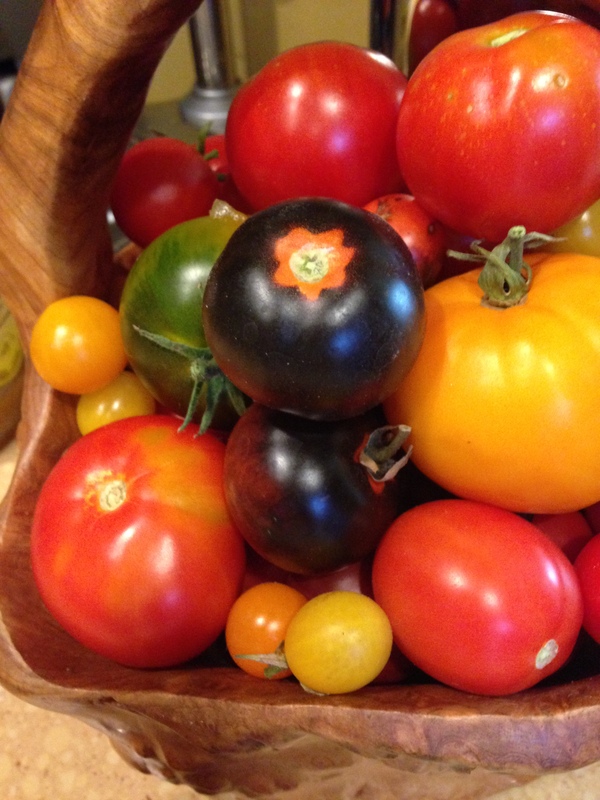 I had some tomatoes left over from last weeks classes. My friend came over and give me some pear. bread with some fresh Parmesan cheese or Ricotta cheese. 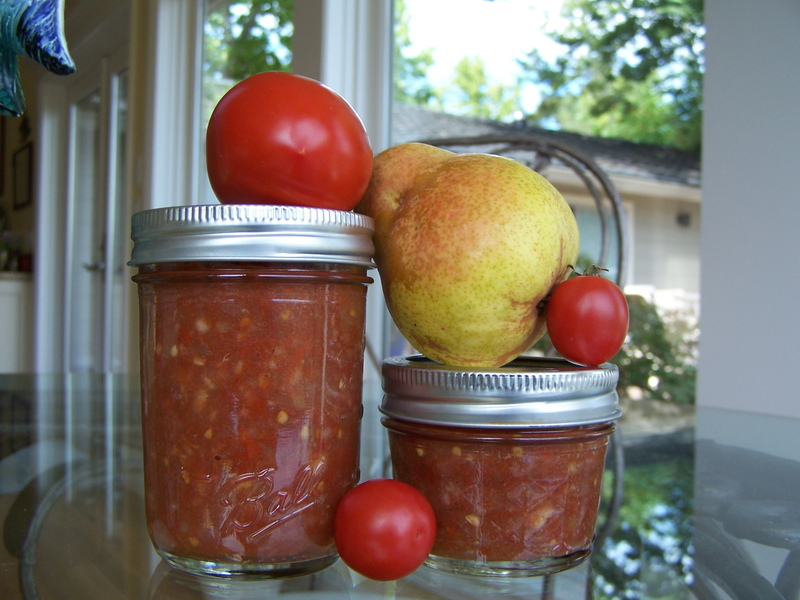 Who would think of making Tomato Pear Jam.